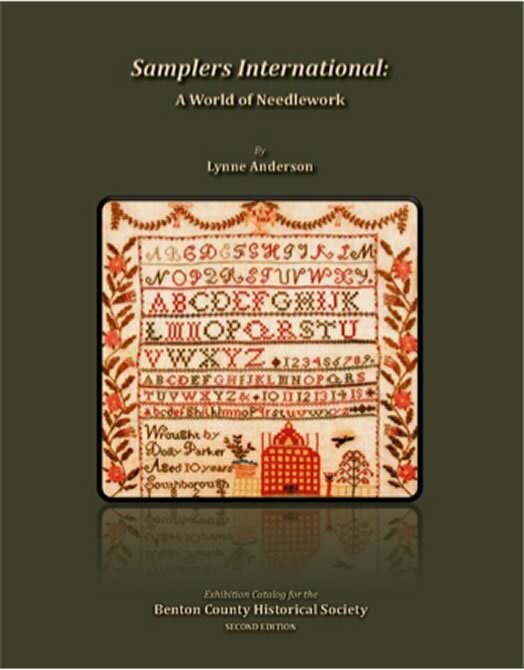 This book was written as an exhibition catalog for the Benton County Historical Society’s sampler exhibition March 11 – April 30, 2011 in Philomath, OR. At the core of the exhibition were 30 historic samplers from public and private collections in Oregon. The samplers represent needlework traditions from many different countries and are arranged to highlight the features of schoolgirl embroideries from the various geographic regions represented. Introductions to each geographic section provide an overview of identifying characteristics for samplers stitched in that country – including the United States, England, Scotland, Scandinavia, France, and Mexico. Entries include high quality images and extensive research that places each sampler in historical and social context, with an emphasis on the girl’s family and future life. Showcased within the section on American samplers are multiple samplers from a single school in Massachusetts; samplers made under the instruction of Quaker teachers, Family Record samplers, and a pair of samplers made by half sisters that traveled from Southboro, MA to Philomath, OR over a period of 200 years, passing from one family member to another and treasured as heirlooms by increasingly distant relatives.